It’s like skiing on rails. The Hagan Core binding is a powerful, full-featured binding that is amazingly light on the climb. Several nifty innovations make the Core a polished product with excellent skiing and release properties. A patented system lets the heel-pins rotate about a pivot versus travelling on a flat axis like traditional “U” springs. This enables easy step-in with improved retention and release characteristics. The heel housing also rides on a spring, absorbing energy and providing an elastic response to ski flex. Also of note, the climbing risers are very slick! Magnets keep them in place but are easily changed with a flick of the pole. They can be used on either side of the tower, meaning there are fully 5 different height positions. Refinements to the toe piece make the Hagan Core easy to step into and less affected by boot wear. A brake in integrated which stays retracted while touring and deploys in a pinch. Summed up, the Core binding will become a staple of your fleet, ready to tackle the biggest mountains. Heel Elastic Response System (E.R.S.) absorbs energy during compressions. CAM heel system provides better precision and release with pivoting heel pins. Smooth magnetic risers prevent floppin' and can be used in either direction. 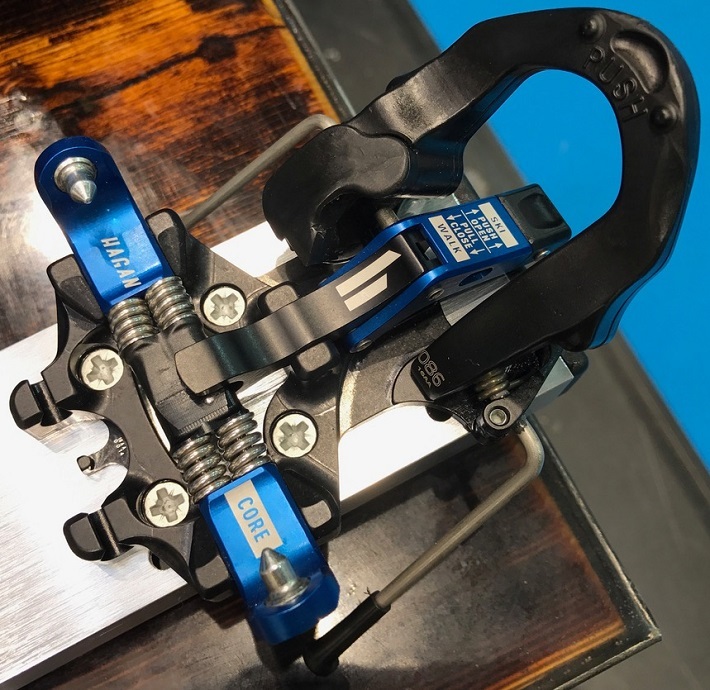 Unique toe brakes stop runaway skis yet won’t interfere with lateral release. Fully adjustable release values range from 5-12 on the “RV” scale. 30mm of heel adjustment will help you fit a range of boots. Integrated crampon receptor will be nice come spring. I bought these last year and mounted them on a pair of black crows Navi’s freebird skis paired with atomic backland Carbon boots. I’m 6’2” 200lb. I have about 20 touring days and 15 resort days on this set up. Touring these bindings work like a dream. Super light and easy to use . 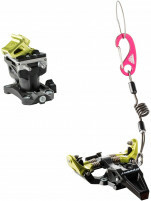 The brake makes so much more sense being on the toe and you never have any issues with it releasing when climbing. I have kingpins and my girlfriend has g3 ions and the brakes release on the uphill at least once per trip and often more. There are a lot of climber options but I really tend to only use the same couple. On the downhills this binding will impress you. For such a minimalist platform you receive big time dh performance. So much so I ended up useing this set up at the resort way more than I ever intended. All that said I have not fully released from these. I also have not fallen hard enough to warrant a release either so that is in the back of my mind . I would like to know that they will release when needed but I’m not going to force that to happen. All in all if you are looking for a super light zero compromise binding I highly suggest you checking out the Core. how are they at the resort? I need a set up I can use on both sides, but more so in the back country. They are awesome At the resort . But like I said I just wish I had the experience of a full release just to ease my mind. As far as dh performance they are awesome and when you use them in the back country you will really like them . The simplicity really stands out and they are super light. What a great binding. Refined. Well engineered, thoroughly thought out in so many ways. Read the description. Very light. Only ~5 oz/binding more than the Superlite 2.0 with B&D adjustment plate and antitwist; add the SL brakes and it is pretty much a wash for weight, but the Core gives you adjustable lateral and vertical release values, flat on heel and 4 heel lifts (SL 2.0 with antiwist gives you flat on heel w/o brakes and two low heel lifts). Add the adj. plate & antitwist and the price difference disappears; add the extended B&D pins and brakes and the SL2.0 is more expensive. Binding delta is perfect for my Scarpa F1 boots. Easy step in with the toe and very easy for downhill with the heel. Very nice having brakes that stay down until you deliberately put them up. I hate flip lifts, but these work as well as one could wish. A clean front to the heel piece minimizes ice buildup. Lots of other features (read the Skimo write up) but all-in-all the best binding on the market for ski touring and ski alpinism. Hi Matt, the spacer isn't necessary for most folks. If you're unusually large or aggressive it may take some stress off the pins. We'll have those in stock in the fall. other than weight is there any reason not to use these? asking cause I AM a heavy guy,..
Hi Daniel, not really any other reason. I would check there is no interference with your boot soles in lateral release. Wondering how the Hagan Core would pair up with Dynafit Cho Oyo ski. Looking for a lightweight but solid tech binding for a pair of 182 Cho's. Will be forsidecountry/backountry and resort uphill/downhill laps. How does the ski mode's ramp angle compare with other bindings, like the Vipec? Hey Evan! 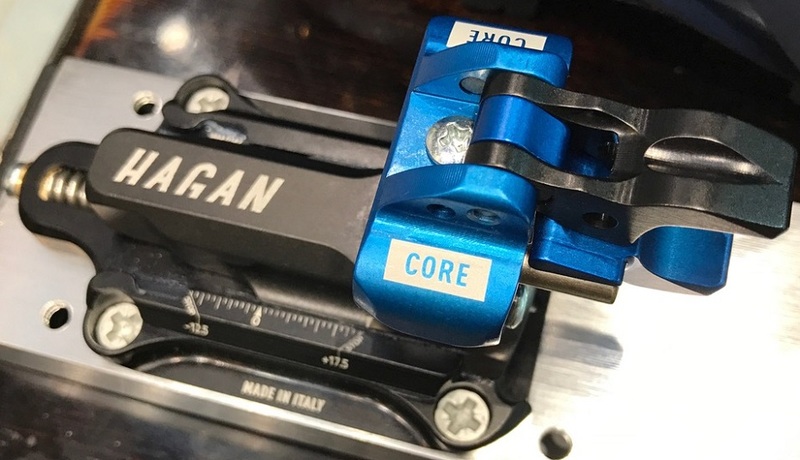 We've got a huge article that nerds out on the ramp angles/deltas that can be found here, but the Hagan Core has a +10.5mm delta and the Vipec is +10. We haven't measured the Vipec Evo though so I can't verify for sure if the newest model is the same, but I think the pin heights and geometry remained the same between the new model and the old model, so I believe it's still +10mm. What is recommended heel gap for these bindings? Hi Fedor! It is 4mm. Do these binding have same screw pattern as dynafit? 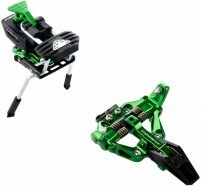 eg, can I replace dynafit bindings with these and use same screw holes? Hi Pat, likely not, but you may be able to reuse some holes. See here for a list of all the mounting patterns to find your specific model. What brand of ski crampon works with these? Hey Will! It's a "Dynafit style" crampon mount so a Dynafit crampon will work, but ATK is definitely the preferred crampon (and my personal favorite) for the Core! Will, I have this binding and just bought the ATK for it. It was wet enough this weekend from the heat that my normally super grippy skins were slipping on things they'd typically walk up. The crampons worked like a charm. They are very light and I was able to walk up pitches by hiking buddy was climbing in his snow shoes. Get the ATK. You won't be disappointed. I have the Core paired with the 177 Movement Apex. All I can say is WOW! They're easy to get in, are very light, but ski better than the Radical FT it replaced. What a great combo! Here's the ski on its first trip out! Sorry I left off a pic of the binding. As an additional side note, we were up on Shasta and a buddy who skis on Dynafits handed me his ski to put some Butter overlay on. When I put it back on the snow, it almost rocketed into the next bowl. He forgot to rotate the heel. The Hagen brake pops down when the toe opens, so this is never a problem. 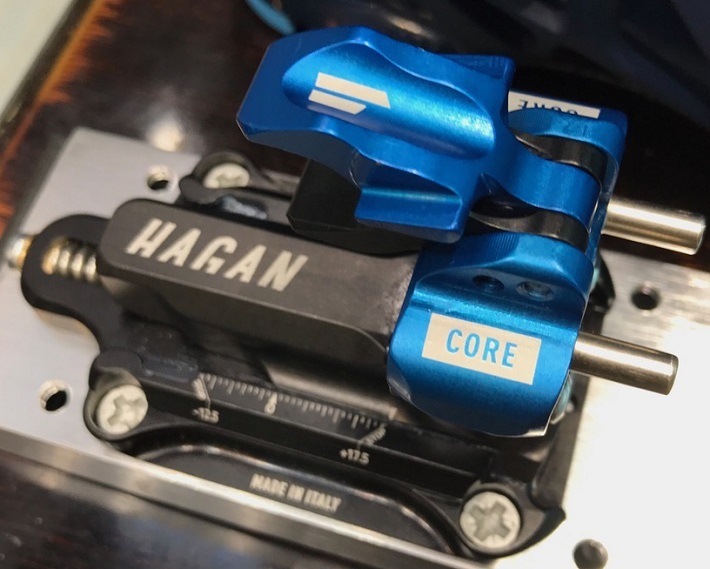 1) Is the Hagan Core manufactured by Hagan or ATK? From what I have read, it is somewhat confusing. 2) I will be mounting to Voile V8 186 at 115mm underfoot. 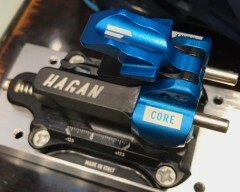 Does Hagan Core offer a compatible brake width? 3) Is it possible to remove the entire brake assembly from the toe piece if desired , as opposed to just the actual brake itself? 4) Is the toe/heal screw hole mounting pattern wider than typical? Would you know if the mounting pattern of the Core exceeds the re-enforced binding mounting area on the Voile V8? Thank you for you help and assistance. Hi Tony, the Core was designed in conjunction with ATK and is a significant improvement over the Raider 12. 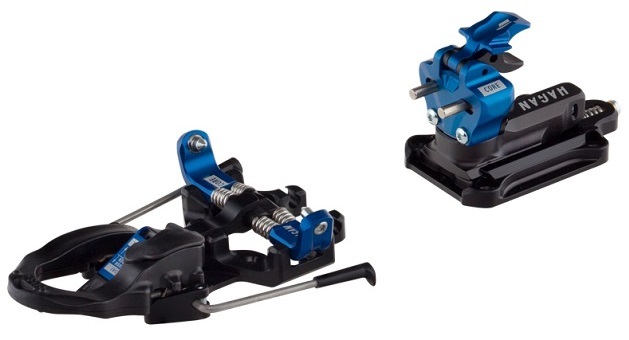 Currently 108mm is the widest brake available; it barely fits over a Wailer 112. It's close, and may work with your V8 with some bending, but the stopping power may be compromised to some degree. You can remove the brake itself, but the supports for it are built into the toe piece and cannot be removed. The toe pattern is 30mm wide by 27mm long, and the heel is 45mm wide by 60mm long. I've spoken with Voile and the dimensions of this mounting pattern fit well inside their mounting plate dimensions, provided you are mounting on their recommended midsole location. Can you tell me what the pin height difference is between heel and toe on this binding? I notice it isn't on your chart that lists this. Thanks! Hi Kevin, I've taken those measurements for you. The Core binding has a +10.5mm delta.